In Bible study (at Chazown!!) this week we talked about Moses and how desperately he tried to get out of God's call on his life. One of his excuses was that he didn't know enough about God to tell the Israelites about him. I was struck by God's response - he tells Moses his name (I AM) but also explains who he is - a God of action: God who is sending Moses to his people, God who was with their ancestors, and God who will be remembered through all generations. 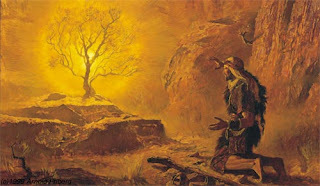 God assures Moses that he is not confounded by the Israelites' slavery - he was with Jacob when he brought his family to Egypt generations before - and he will be the God remembered by the children of Israel, not the gods of Egypt. Jesus' life was not the only time that Yahweh stepped into human history - as he taught Moses in the wilderness near Horeb: he IS. He exists beyond creation, but he desires to be known through creation - through his people and by his people.